Use the Helm transient state to navigate the Helm results using Vim keybindings (hjkl) and call additional actions on those results. Enter this transient state with M-SPC or S-M-SPC while in a Helm buffer, for example, when navigating the results such as file find SPC f f, buffer list SPC b b, or Emacs commands list SPC SPC. M-SPC is used by the Gnome desktop for the window menu, so recommend you change the Gnome keyboard settings to use a different binding, i.e. Super w.
The transient state menu is really great for running actions over multiple files. In this example Helm Transient State menu is used to select and kill multiple buffers easily. Combining the pattern based searching with marking files (T marks all files listed for a particular pattern) makes it really easy to kill lots of Magit buffers that are no longer needed. Using layouts in Spacemacs will show a prompt when you kill a buffer that is not in the current layout. You can see this prompt at the end of the video as I kill all the magit buffers. I separate projects into their own groups of buffers to make it easier to work on multiple projects through out the month. 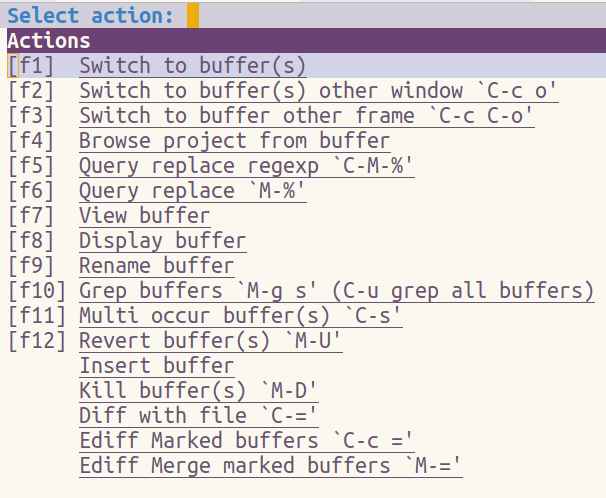 Select a switches to the actions page, or using C-z displays the list off all the available actions for a buffer.